Nothing beats a Mexican brunch on the weekends! The salty, crunchy, saucy, cheesiness of a giant plate of chilaquiles after a late night out! They are the perfect combination of textures, flavors, and grease to help you with that weekend hangover. You can make this recipe as easy or as complicated as you like. 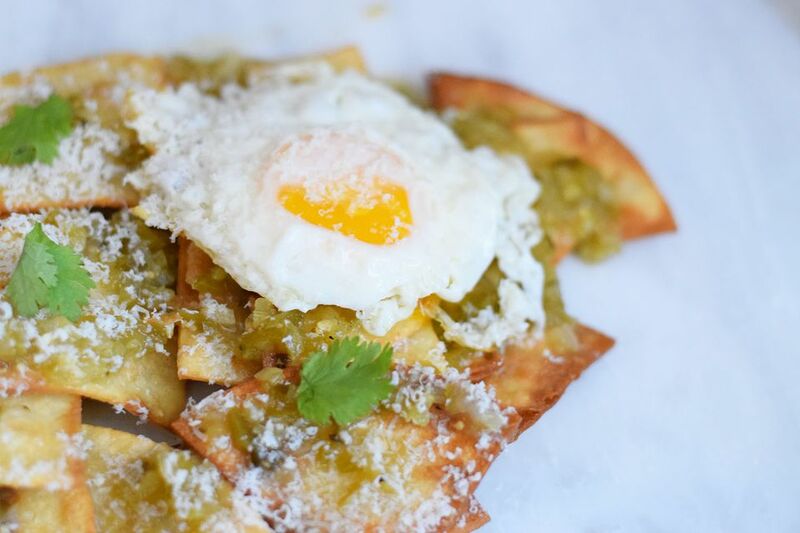 In this recipe it calls for frying your own corn tortillas, and blending your own salsa verde! But, you do not have to make either of these things from scratch. There are many delicious salsa verdes out there that you can buy and just heat up before tossing with chips. You can choose to make this a super spicy breakfast or one that is more mild by buying different temperature store bought sauces. You can buy store bought chips instead of frying them yourself. The recipe definitely tastes the best with the homemade chips. Their texture stands up to the salsa really nicely and has a good balance between crunchy and a little chewy. No matter what way you go this breakfast is super satisfying and delicious! Heat the light oil such as canola or grape seed oil in a heavy bottomed dutch oven or pot to 375 F. Use a candy thermometer to measure the temperature of the oil. Just make sure that the bottom of the thermometer is not touching the bottom of the pan! Fry the tortilla chips in batches. Be careful not to crowd the chips, make sure they are not sticking together by moving them around with a slotted metal spoon. Flip after about 2 minutes. Cook until golden brown on both sides. Drain and place on a paper towel lined plate. Combine all of the salsa verde ingredients in a pot. Heat on the stove for 10-15 minutes. Let the ingredients cool slightly and then add them all to a blender. Blend until smooth. Place back in the pan and heat for another 10 minutes. While the salsa verde is cooking, cook the fried eggs. Place a few table spoons of the frying oil in a frying pan. Heat on medium heat. Crack the two eggs into the pan and baste the hot oil over the top of the eggs to cook the tops of the eggs. Once eggs are cooked, remove them from the heat. Place about 1-2 cups of the salsa verde in a large bowl. Add the chips and toss until they are completely coated. Split them onto two plates and top each with an egg and the queso fresco and thinly sliced white onion. You can also add more fresh cilantro as a garnish. Enjoy!